Gualala is located on the Pacific coast at the mouth of the Gualala River, on State Route 1. 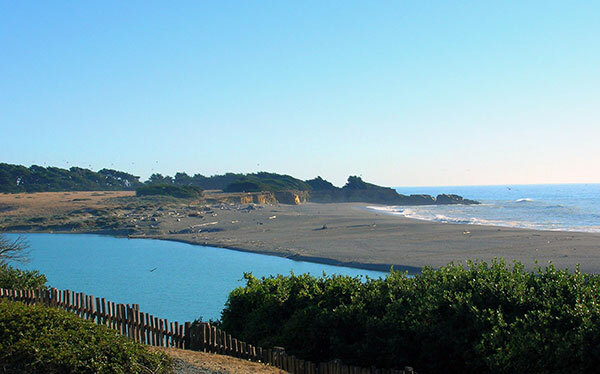 The Del Mar Landing State Marine Reserve lies onshore, about two miles south of Gualala. Local residents swim, fish, picnic, kayak, and canoe the river. There is a variety of wildlife in Gualala including whales, does and fawns, river otters, and birds. Activities: Beaches, biking, birding, camping, fishing, hiking/walking trails, kayaking/canoeing and picnics. Parts of the river follows the San Andrea's Fault. Doghole schooners used the river as a refuge from heavy seas. Gualala River, has two principal microclimates. The first microclimate is from the bridge out to the ocean. The second is from the bridge to the Redwood forest. Typically in summer high tides and strong waves push sand at the mouth of the Gualala River higher and higher until it blocks the tidal flow, and the sandbar extends to become a natural dam through which the river and ocean filter imperceptibly with the tides. The Gualala River estuary is in the migratory path of many birds and waterfowl. Once a world-class Salmon and Steelhead fishery, the Gualala River is now open to catch-and-release Steelhead fishing from the opening of the river mouth until March 31. Like an underwater park, this marine protected area helps conserve ocean wildlife and marine ecosystems.In this region, one of the four most productive ocean upwelling systems on the planet brings nutrient-rich waters from the depths. Seasonal surface currents and prevailing winds carry this rich food source southward to provide the base of the marine food chain for an abundance of aquatic and avian life extending at least as far south as the Monterey Canyon. Gualala Bluff Trail provides spectacular estuary and ocean vistas for a half-mile stretch paralleling the bluff edge as it winds west of the Gualala commercial district. Winding along the bluff, the trail, several bridges and overlooks allow opportunities to experience Gualala River Estuary wildlife "up close and personal." Gualala is home to a thriving art community. There are a variety of art galleries to visit in town or take a short trip north to the Coast Highway Art Collective. In town there is Gualala Arts Dolphin and Placewares to name just a few. Gualala Arts Center you can find art exhibits, workshops & classes, classical & popular music performances, theater, lectures and much more. Since 1961, Gualala Arts has served Sonoma and Mendocino County coastal residents and visitors with year-round programs of art, music, theater and education. The North Coast Artist Guild was formed in 1997 as an affiliate of Gualala Arts to better serve working artists in the Mendocino and Sonoma coastal communities, from as far south as the Russian River to as far north as Little River. There are currently about a hundred members.. The 195-acre park has open meadows mixed with coastal forest. The park contains a campground, trail system, coastal vistas, and sandy beaches. The park is located adjacent to the Gualala River. delightful boating experiences on the Gualala River. The Gualala River Watershed Council is a local nonprofit organization working to restore the natural balance of the watershed and preserve its environment from further degradation. Trinks is a family owned business started by Kathleen “Trink” Woodward as a dessert and coffee shop in 2003. It has grown to play an essential role in the coastal town of Gualala, offering full breakfast and lunch menus daily, gourmet dinners three nights a week, and custom catering. Excellent, local, organic, delicious food made fresh and in-house in a gluten-free facility. Small, intimate dining room perfect for small parties or just a great meal out. The Roadhouse features authentic wood fired Texas pit-style BBQ along with a complete selection of smoked meats (including Beef Brisket, St Louis Pork Ribs & Salmon) we serve Seafood, Clam Chowder, Killer Steaks, Monster Burgers (2lb Challenge), Appetizers, Kidz Menu, Desserts & on weekends a Full Breakfast. The Pomo indians who lived in the area gave the Gualala River a name that meant "water coming down place." The town took its name from the river. The word the Pomos used was very similar to the present day pronunciation of Gualala. General Rafael Gracie was given a land grant extending from the Gualala river north to Mal Paso creek. This land grant was for about 62.5 square miles. He used the land for grazing cattle & later sold the land for $10,000. The grant was eventually deemed invalid by the courts. In 1861, a man named Cyrus Robinson & his wife Elizabeth filed a homestead for all of the area which is now Gualala. They built and owned a hotel, a saloon and a ferry in Gualala. They also supervised the Post Office (which was also the stage stop), the Wells Fargo Express and the Western Union. Within a year they sold part of their land to the men who would build the first lumber mill in Gualala. This mill was Lumbermill located at the mouth of Mill Gulch, now known as China Gulch. About 1871, the Mill Company started a company store. From the 1860's on, tourists have been coming to Gualala. They came to hunt, to get away from the crowded cities and relax, to enjoy an area where flowers are blooming all year, to fish for steelhead or salmon and to dive for abalone. In the late 1800;s Gualala was a major commercial hub for the entire area. By 1895 there was a dancing school. the Gualala Municipal Brass Band and an Opera House in Gualala. In the early days it took 2 days to travel the 40 miles from Jenner to Gualala. By 1877 a railroad line had been built connecting Duncan's Mill to Sausalito. From Sausalito passengers could take a ferry to San Francisco. Because of this railroad, daily stage service was started between Mendocino & Fort Ross on the coast and between Fort Ross & Cazadero.